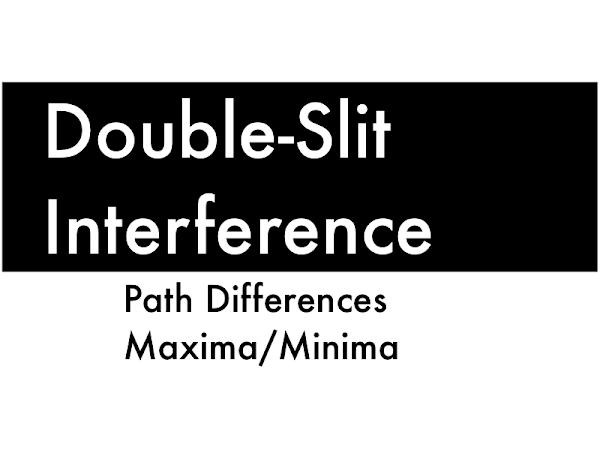 "The relationship between slit width and destructive interference angles. I sort of skimmed past the electrostatic charge stuff, so I think I understand what's going on, but I'll have to go back and reread it." "The basic concepts of diffraction, and charges. But I am overwhelmed and confused by the material that has built up to this point." 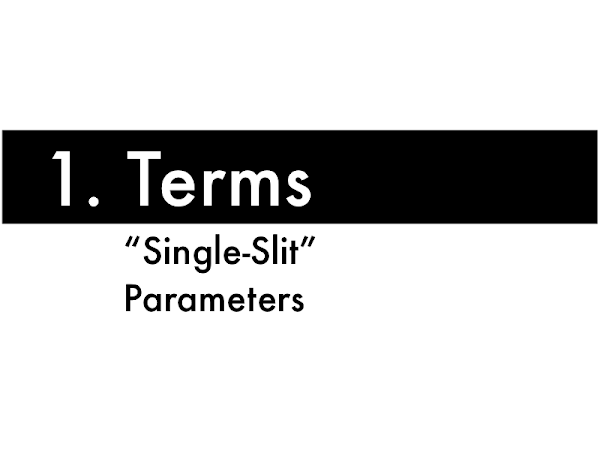 "In cases with a single slit there are two relevant parameters: the wavelength and the slit opening width. These parameters affect how the waves diffract and spread out (shown by a half-angle θ). 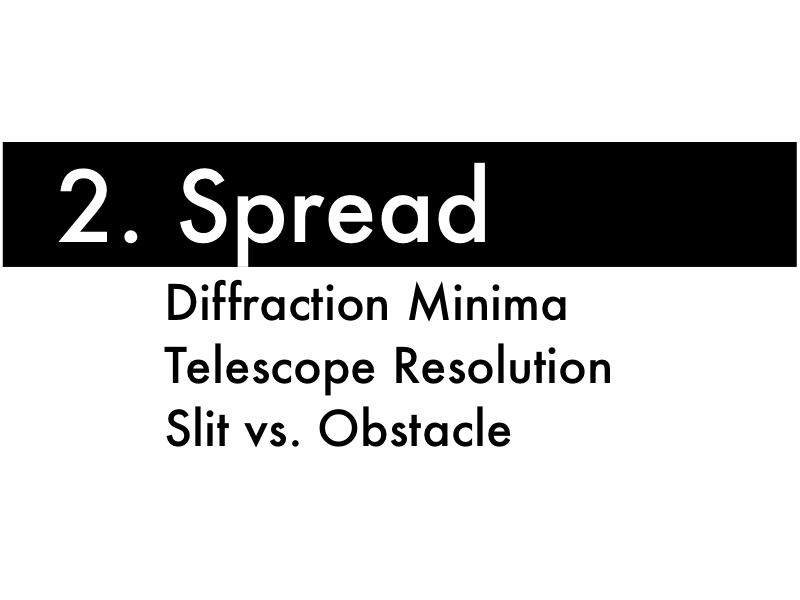 In all cases with single slit diffraction there is a faint dark region that is a destructive region that separates the two sides, this is the first minima angle." "Smaller W results in more diffraction and a larger W results in less diffraction." "In an insulator, valence electrons are able to move to different positions relative to the atom, but they remain relatively fixed; there is no movement of electrons from atom to atom (For the most part). In a conductor, valence electrons are able to move freely throughout the entirety of the material, from atom to atom." "In an insulator the outer electrons are fixed to their atomic locations but can move around these locations. 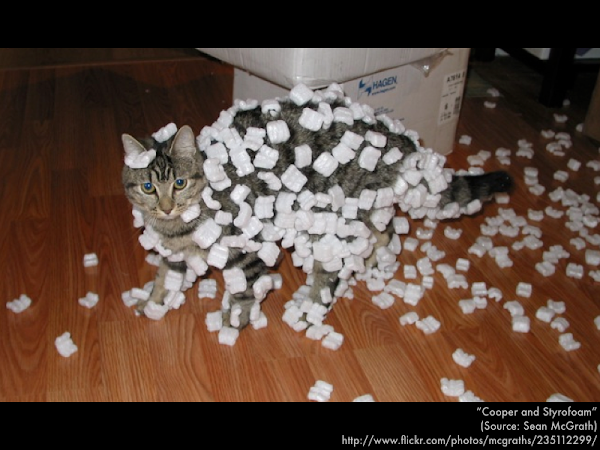 In a conductor the outer electrons are more free to move around the whole material." "Still confused between minima and maxima." "For once I think I'm pretty okay with the concepts. It's probably thanks to my chemistry background, but nothing really confused me." "The net attraction of insulators and conductors. I can't really visualize the net forces, and I'm really confused on the negative and positive attractions." "The woman became electrically charged when she got back in her car and the fabric she is wearing rubbed against the seat. She either lost, or gained electrons." "The jacket that the woman has on is charged after she sits down and gets back up, therefore once she came in contact with the neutrally charged gas nozzle the electrons were transferred between the nozzle and woman, resulting in igniting the gasoline." (A) central supermassive black hole. (C) lack of solar systems. Several old globular clusters contain younger stars, as determined by observations of the __________ of these stars. Look at this fire hose nozzle. Just look at it. Pinching the flow of water makes it spread out more; while opening up the nozzle narrows the spread of water. This is by no means explains what we will see with waves that move through a single opening, but this very crude analogy will serve our purposes well enough. Previously we considered the interference of waves from separate in phase sources, as monochromatic (same wavelength λ light) through two slits. 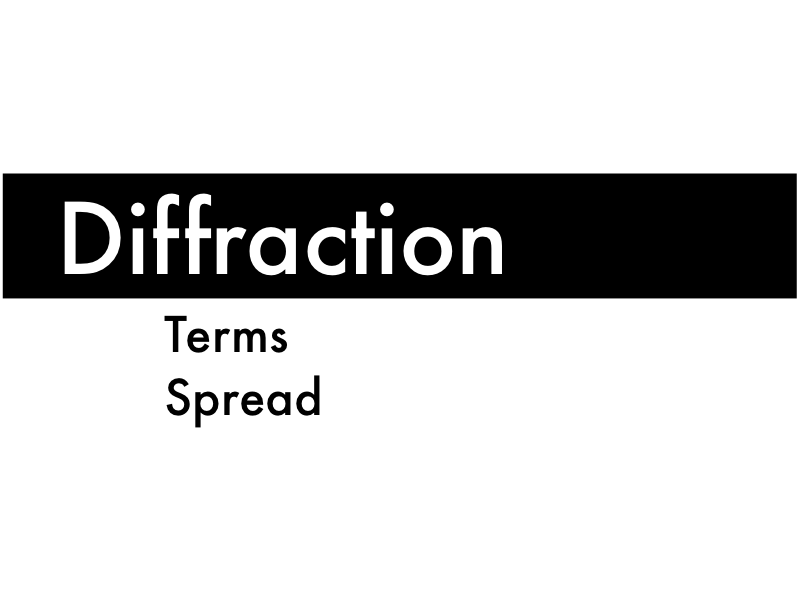 Here we look at diffraction, which is the spread of light from a single slit. Notice how these parallel water wavefronts spread out after passing through the central opening in this inlet. This is an example of how waves diffract as they pass through a "single-slit" opening. The relevant parameters are the wavelength λ of the parallel wavefronts and the slit opening width W, which affect how these waves diffract and spread out, given by the "half-angle" θ, as measured from the center line. Second, quantifying the spread of these waves after diffracting through the singe slit. If you squint (in order to increase the contrast of the diffracted wavefronts), you can make out a faint destructive region on either side of the center line, which forms the boundary of most of the diffracted wave energy. This is the first minima angle θ. The equation for this diffraction minima is given by Wsinθ = mλ, where θ is the "half-angle" of the spread of the diffracted waves, and m = 1 (which if this doesn't freak you out by the resemblance to the double-slit maxima equation, it should). Just work with this, and let's see what it can tell us. 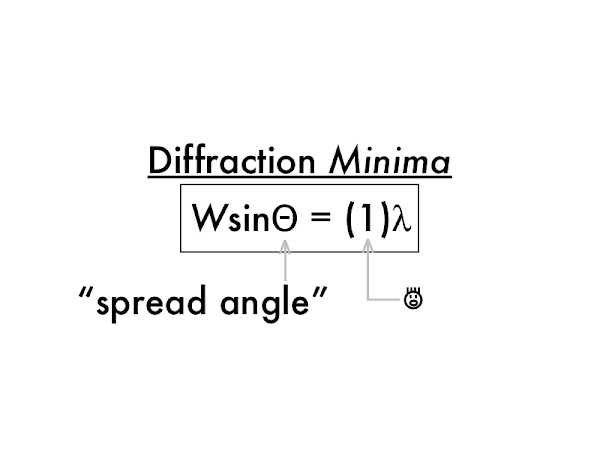 Since the slit width W and spread half-angle θ appear on both sides of the first diffraction minima equation, then making the slit opening smaller would result in increasing the spread of the diffracted waves. 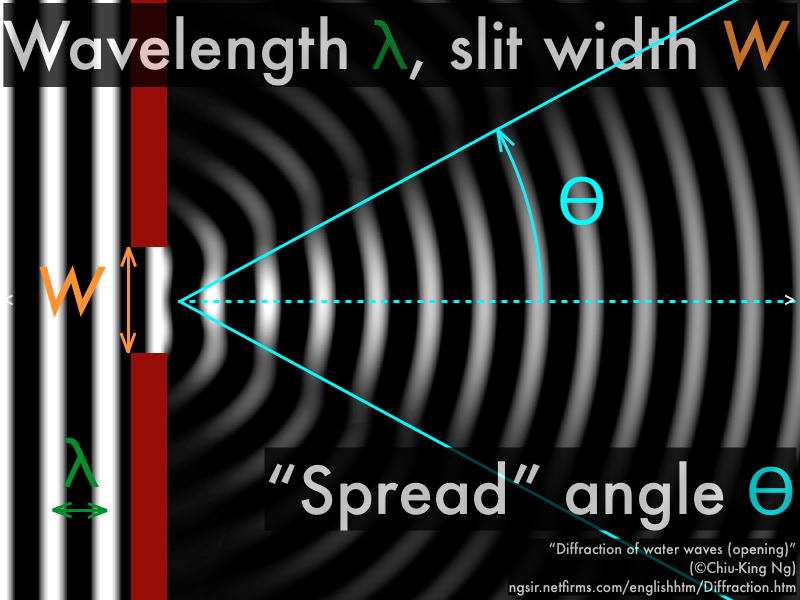 Also making the slit opening larger would result in decreasing the spread of the diffracted waves. An example of this is the diffraction of light through the circular aperture of a telescope with a "width" W (although the more correct equation in this case would have a correction for a diameter of a circular opening: Wsinθ = (1.22)(1)λ). 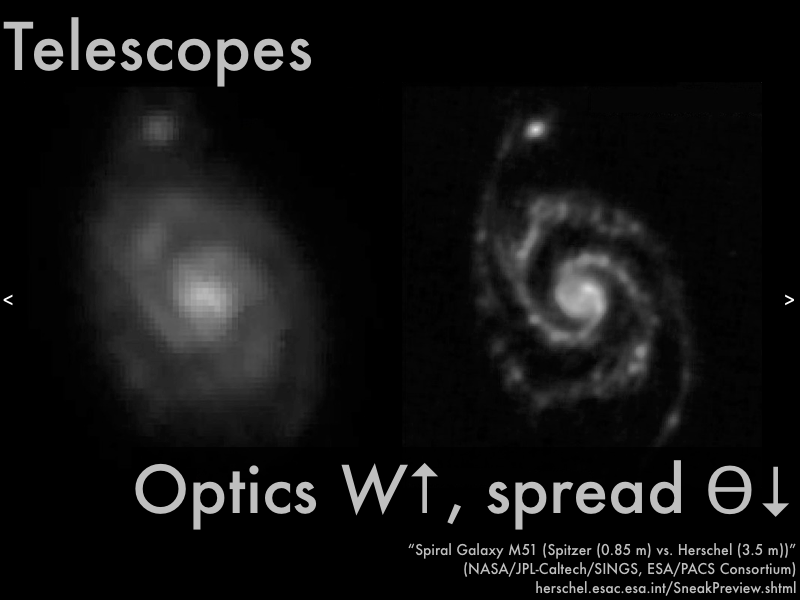 This is the Whirlpool Galaxy M51 as seen by the NASA Spitzer Space Telescope and the European Space Agency Herschel Space Telescope, as observed with the same infrared wavelength λ. As the Spitzer Space Telescope has a much smaller mirror diameter, light from each part of the galaxy will diffract more and spread out more, resulting in a much less resolved image than from the Herschel Space Telescope, with a much larger mirror diameter, such that light from each part of the galaxy will diffract less and spread out less, resulting in a much better resolved image with finer details left intact. 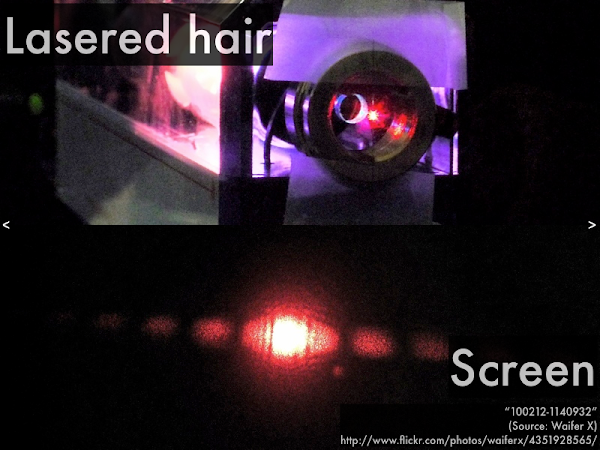 In laboratory you will shine a laser on your hair. Since the lasers are relatively low-powered (but don't shine them in your eyes), you won't be able to burn through your hairs, but light will diffract around either side of the hair shaft. This turns out to be entirely equivalent to light shining through a single slit of the same width as your hair, and the resulting diffraction pattern on a distant screen shows the spread of light contained within the first minima θ angles on either side of the center line. Depending on how thick your hair is will determine how little (or much) light will diffract and spread out on the screen. "Paying close attention to the diagrams. 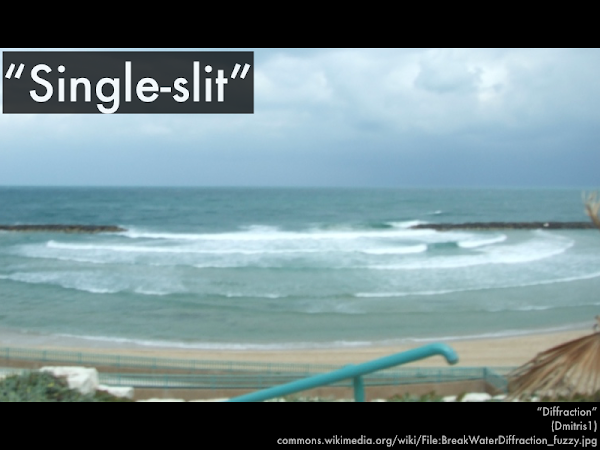 We're looking at waves at various angles to see how it affects interference." "When there is two side-by-side in phase wave sources--because the wave sources are in phase, what we are concerned about in this case are path differences only. 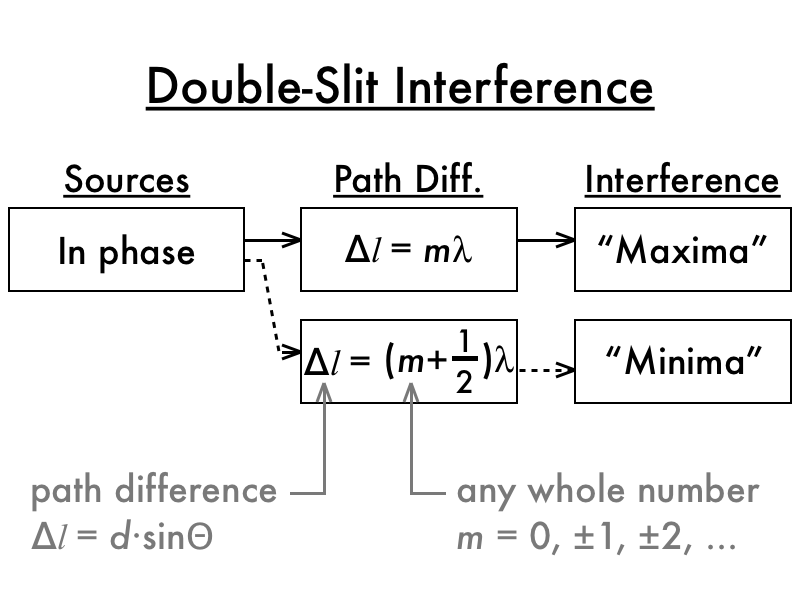 In double-slit interference a condition that is constructive is maxima, and a condition that is destructive is minima." "Since light is a wave it travels through slits creating dark areas and bright areas depending on how it has interfered with other waves of the same wavelength." "I don't understand the logic of path length differences. I'm not sure how to how to explain or walk through setting the equation up." "This seemed pretty straightforward, even from just skimming it." "I don't get how this is mathematically quantified." "I am having trouble on deciding if something is in phase or out of phase. 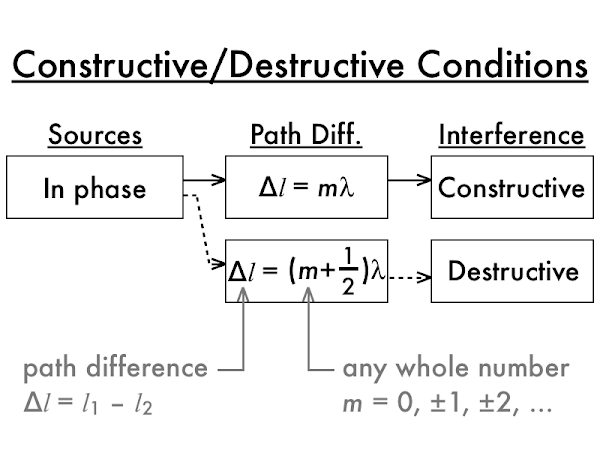 Also another thing i am not understanding is if it is destructive or constructive. I tried the chart from the previous blog but i am still a little bit confused." "Maxima are points of constructive interference, and minima are points of destructive interference." "Maxima is the location where light from two individual sources are reinforcing each other and correspond to points of brightness. Minima as where two individual sources are destroying each other and correspond to points of darkness." 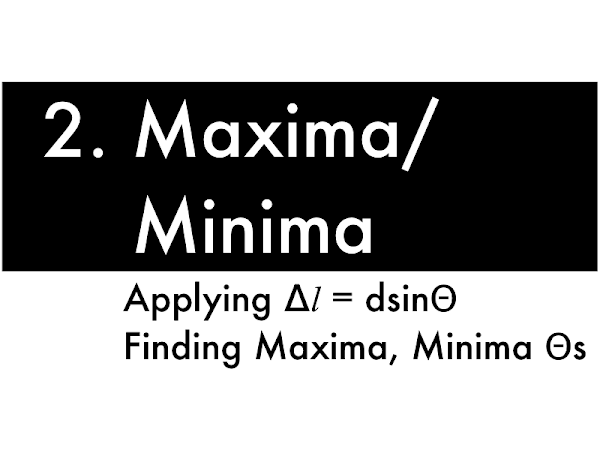 "Minima = constructive interference, maxima = destructive interference." ""These assignments are a lot harder to do when you haven't had time to read the book." "Mars' biggest volcano, and trying to imagine what it looked like erupting." "That Saturn's rings are made of ice particles, because I always pictured them being made of rock particles." "How similar Venus is to Earth, and how their 'little' differences are what make Earth able to support life and Venus not able to. " "When I read about Venus's history, I wondered if Earth one day would too mimic its atmosphere (with the runaway greenhouse effect and the fact that their only main difference is the lack of liquid water)?" "How mass of a planet determines whether it holds onto it's atmosphere or not. Hadn't considered it before." "Why Pluto isn't considered a planet, because I never knew the real reasons why they took away its planet status." "Coronae on Venus, because they're a very unique shape and after further reading discovered how big these can be with the biggest one being the Artemis Corona which is 2,100 km in diameter, or 1,300 miles." "Learning about all the planets was interesting, because I haven't since elementary school." "Hw larger planets are more geologically active compared to smaller planets. This is neat because it allows for me to understand the nature of a planet by knowing its mass." "So Venus looks like the greenhouse effect basically took over. They are in the far stages that Earth is only beginning to experience." "If Earth and Venus are of the same mass, then what exactly caused Venus to become a much more inhospitable environment when compared to the Earth? This is a confusing concept possibly because I am not too sure how greenhouse gases work on other planets or on the Earth for that matter." "I am still unclear on what classifies as a planet." 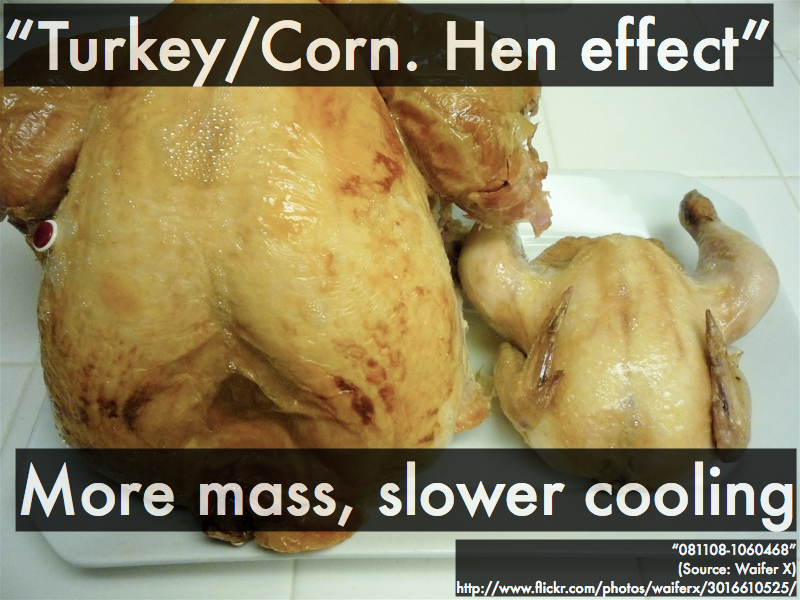 "The Cooper Cooler effect. I didn't understand how a water bottle being spun faster in ice water compared to sitting in a unstirred ice water bath could relate to a formation of a planet." "Pluto has five moons, it's a planet." "It doesn't mater what we think we want to call it, what matters is it is there." "Pluto cannot be classified as a planet because it does not meet the criteria for being 'large enough to dominate and gravitationally clear its orbital region of most or all other objects.' I have to agree that this seems like a pretty good criteria for being a planet as opposed to just a large object." "I think Pluto should be considered a planet because it orbits the sun just as the other planets do; and we considered it a planet for so long, it seems funny to change our minds." "It was a planet when I born therefore should still be one." "It qualifies as part of the dwarf planets, which is why it should not be considered a planet in our solar system." "I don't know if Pluto should have been grandfathered in or should not be since it does not meet the requirements. I have mixed opinions, but do not feel too strongly for either way." "I don't think Pluto should be a planet because if extremely smart astronomers say it isn't really a planet, we should just listen to them and accept it." "Rules are rules. There has to be line that defines what it means to be a planet. If you fall below the line, you're out." "I can see both sides of the debate as to wether or not Pluto should be considered a planet. I don't feel as though I'm qualified to have an opinion if still the experts are still debating." "I am not sure how to feel about it to be honest. I mean I just think it should be a planet. I don't like the rules that apply to make something a planet." 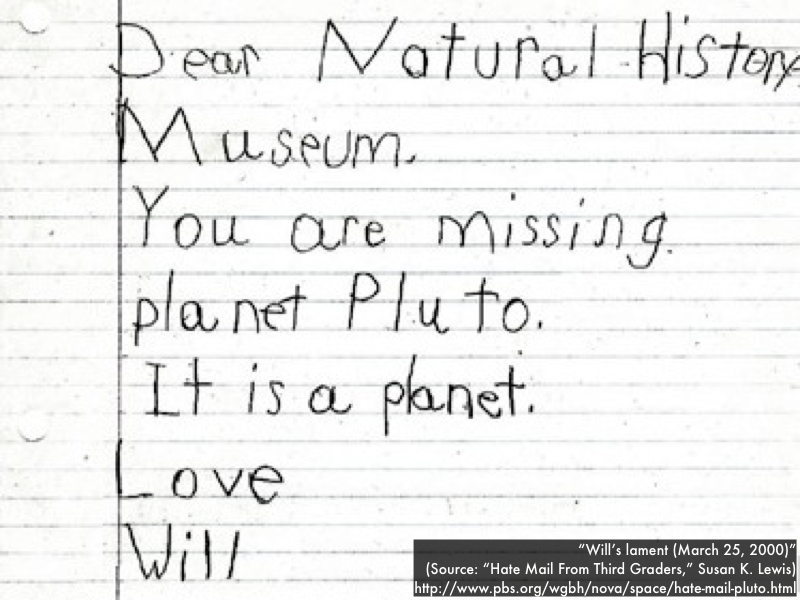 "I grew up with Pluto being a planet so the astronomers are messing with my mind." "Pluto should be a planet because its size compared to Neptune isn't that big of a difference. Also, Pluto is the cutest." "I enjoyed reading about the criteria that makes a planet, a planet. I did realize there were criteria other than it orbits the sun." "That Venus' atmosphere is hot, unbreathable, and very dense." "How quickly the Russian landers were destroyed by Venus's atmosphere." "All things about Jupiter's atmosphere. Growing up that was the most intriguing planet (besides Pluto of course)." "Greenhouse effect. I don't understand how it works for the other planets." "Determining the core temperature of a planet. From my understanding, mass has the most to do with core temperature, but I'm not confident enough to say for sure." 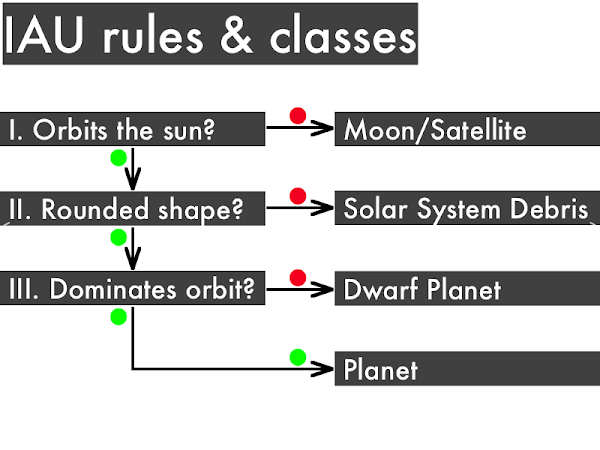 "How Pluto is not a planet! Up until I took this class, I've always thought it was concerned a planet." "It is hard to keep track of all the planets." "How a runaway greenhouse effect occurs and how it can destroy a planet's habitability so quickly." "Because it was through 90% of my life." "Only because it does not meet all three criteria to be considered a planet. That's not saying it might not be promoted to planet later on again, but the fact we do not have clear images to study and determine certain features, it's hard to declare Pluto a planet." "Pluto does not fit in to the category of terrestrial or jovian planets. Also, there are different requirements Pluto does not meet. However, and I may not know enough to say this but Pluto may be a different type of planet. Maybe we just need to do some more tests and research." "It was originally discovered as a planet and I don't think that should be characterized as anything less than that. Kind of like when an adopted child discovers their biological family--people they share the same DNA and personality traits with. It does not mean that they are no longer a part of their adoptive family." "Pluto's like the runt of the planets! It shouldn't be excluded." "I want to say its because I've grew up always with the illusion that it was a planet. As I was reading many think it is not considered a planet because of its size, but I think its actually not that small." "I don't really agree or disagree with the thought of Pluto being a planet. I grew up being taught that Pluto was a planet, but it really doesn't effect me whether its considered a planet or not." "Because I grew up with it being a planet, and I understand it's not anymore because it doesn't fit the criteria of being a planet. But I still wish it was a planet." "It is not big enough to clear its orbital region of other objects." "Pluto fits within the guidelines of a being dwarf planet. I see no reason why it shouldn't be classified as a dwarf planet." "Whatever Neil deGrasse Tyson says about space is probably true, so I really can't argue with him." 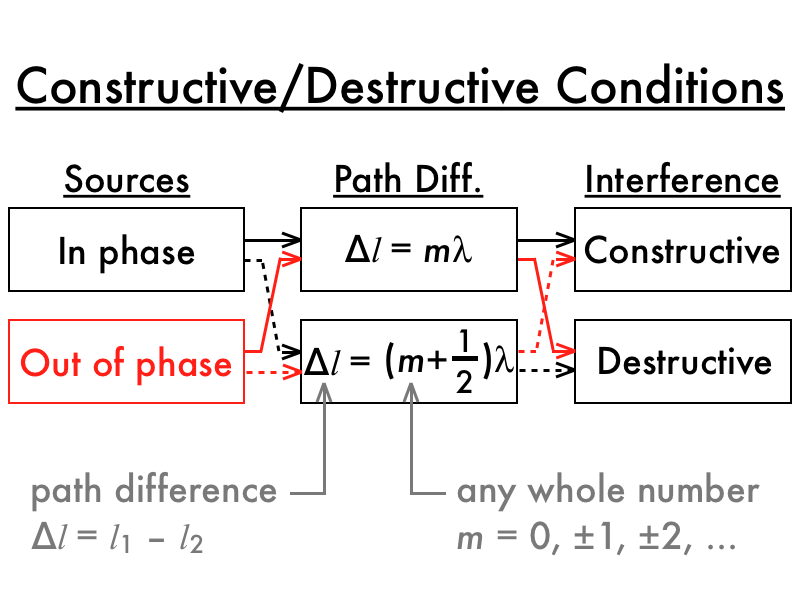 In the previous presentation we discussed the conditions for constructive or destructive interference for waves (of the same wavelength) due to phase and/or path differences. 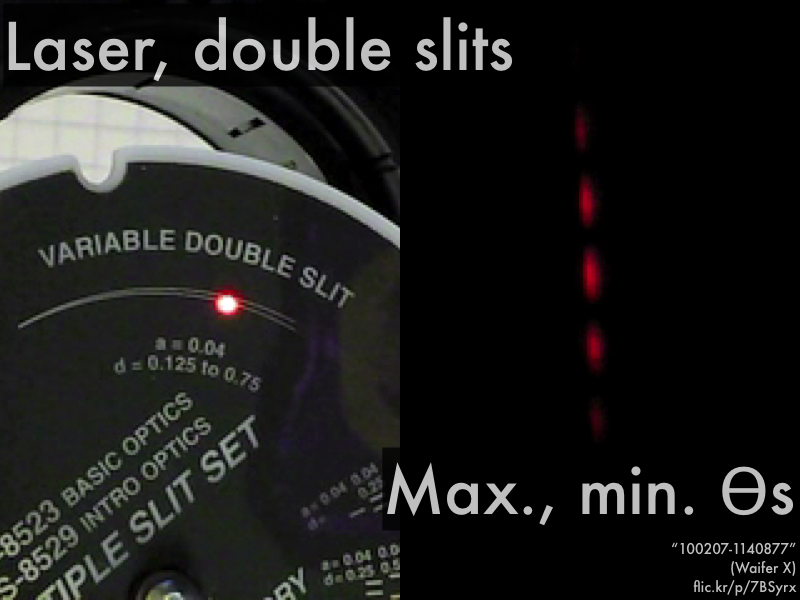 In this presentation we discuss the very specific case of waves (again, of the same wavelength) from two side-by-side in-phase sources, which we will see has been classically called "double-slit" interference. The waves we are considering will come from two sources that are in phase, so we do not need to concern ourselves with the out of phase sources. Since source phase differences don't matter here--only path differences--then we must pay careful attention to the difference in path length: how much longer the wave from one source travels than the wave from the other source, as they reach and interfere at the position of the detector, as it moves from side-to-side. We are going to make the assumption that the detector is sufficiently (approaching infinitely?) far away from the two sources (spaced apart by a distance d) that the two waves will travel along a parallel path 1 and path 2. Then the location of the detector can be specified merely by the angle θ (where θ = 0° would be on the center line). Here's the simple case (θ = 0°) where both waves leave their slits to travel equal distances to the distant detector towards the right. Do the waves start from their slits in phase or out-of-phase? Is the path difference a whole wavelength or a half-wavelength? 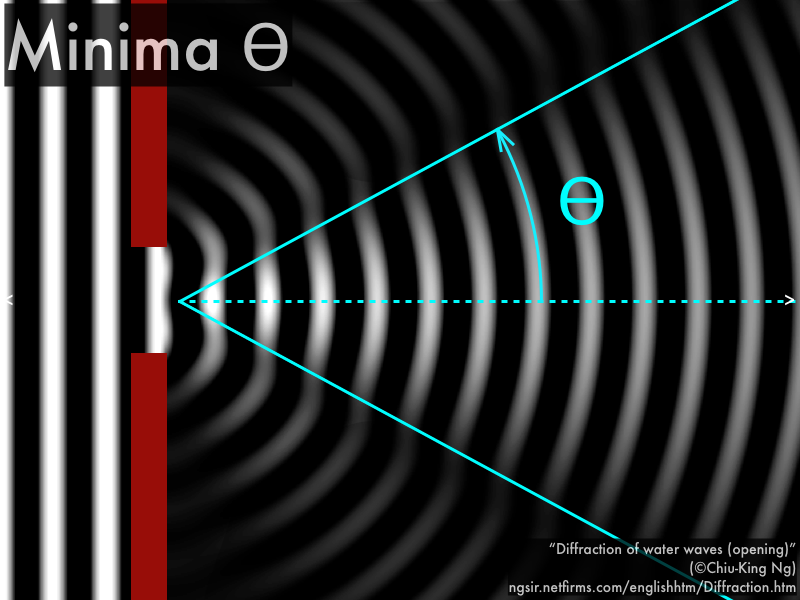 Does constructive interference (maxima) or destructive interference (minima) occur at the detector? In this case, both waves leave their slits to travel unequal distances to the distant detector towards the right, located at an angle of θ = +23° off the (dashed) center line, such that path 1 is shorter than path 2. Do the waves start from their slits in phase or out-of-phase? Is the path difference a whole wavelength or a half-wavelength? Does constructive interference (maxima) or destructive interference (minima) occur at the detector? 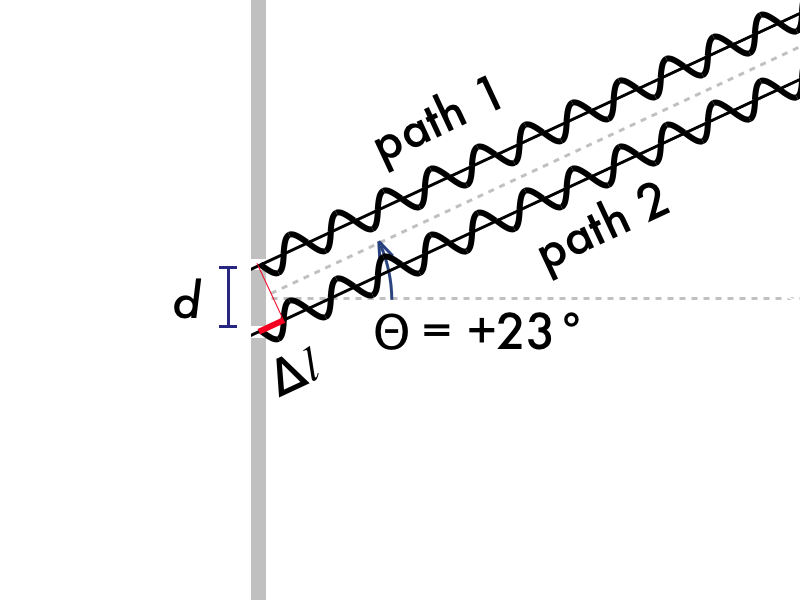 What would happen if the detector were instead placed at θ = –23° (same angle but on the other side of the center line)? Now in this case, both waves leave their slits again to travel unequal distances to the distant detector towards the right, located at an angle of θ = –51° off the (dashed) center line, such that path 1 is longer than path 2. Do the waves start from their slits in phase or out-of-phase? 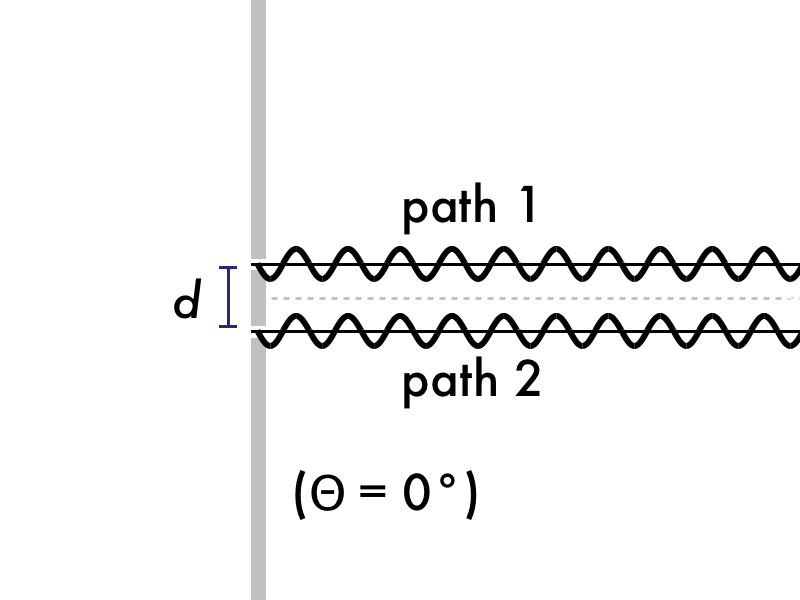 Is the path difference a whole wavelength or a half-wavelength? Does constructive interference (maxima) or destructive interference (minima) occur at the detector? 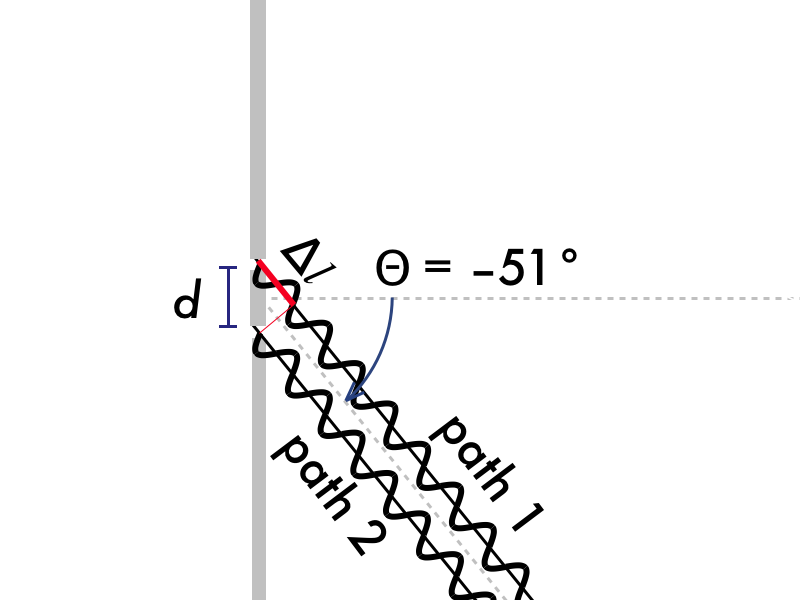 What would happen if the detector were instead placed at θ = +51° (same angle, but on the other side of the center line)? Second, where we are going with this path-length difference relation: locating where these two sources interfere constructive (maxima) or destructively (minima). 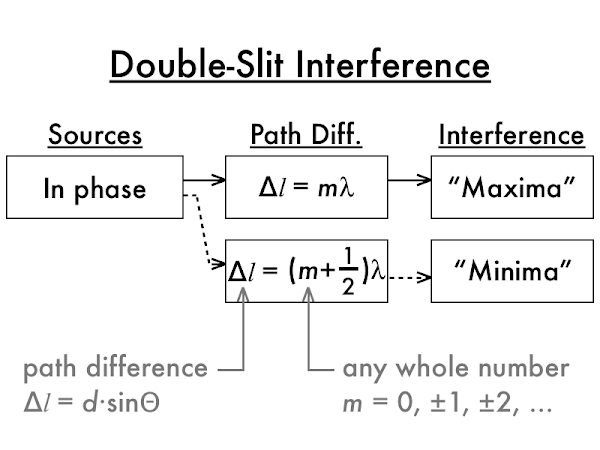 As discussed before, for in phase sources, the difference in path length will be some integer m multiple of a wavelength for constructive interference, or will be some integer and a half (m + 1/2) multiple of wavelength for destructive interference. So now let's put in our approximation for the path difference ∆l = dsinθ, for two waves from side-by-side sources reaching a (distant) detector located at an angle θ. What we will wind up with is a relation between the angle θ that a distant detector is located at, and the condition for either constructive (maxima) or destructive (minima) interference to occur. So given the wavelength λ of the two side-by-side sources, and the separation distance d between the two side-by-side sources, then plugging in different integer m values (0, ±1, ±2, ±3, etc.) allows us to solve for different θ angles where either constructive (maxima) or destructive (minima) interference occurs. You will demonstrate this for yourselves in recreating a classic experiment in laboratory. Using laser light (of a given wavelength λ) that illuminates two very closely spaced together slits (two in-phase sources spaced a distance d apart), there will appear bright (maxima, or constructive interference) regions and dark (minima, or destructive interference) regions on a screen (the detector) at certain θ angles, as predicted by the double-slit interference maxima/minima equations. The following questions were asked on reading textbook chapters and previewing presentations on optical instruments and interference. "Phase differences and path length differences can lead to constructive interference (where the waves and troughs are in sync) or destructive interference (where the waves and troughs run into one another and cancel each other out)." "Both microscope and telescopes, also have a good understanding on constructive and destructive sound waves as well." "Microscopes and telescopes are very similar in their construction, the main difference being that a telescope's objective lens focuses objects that are as far as infinity (whose rays could be basically parallel) to create a real image onto the focal point of the eyepiece." 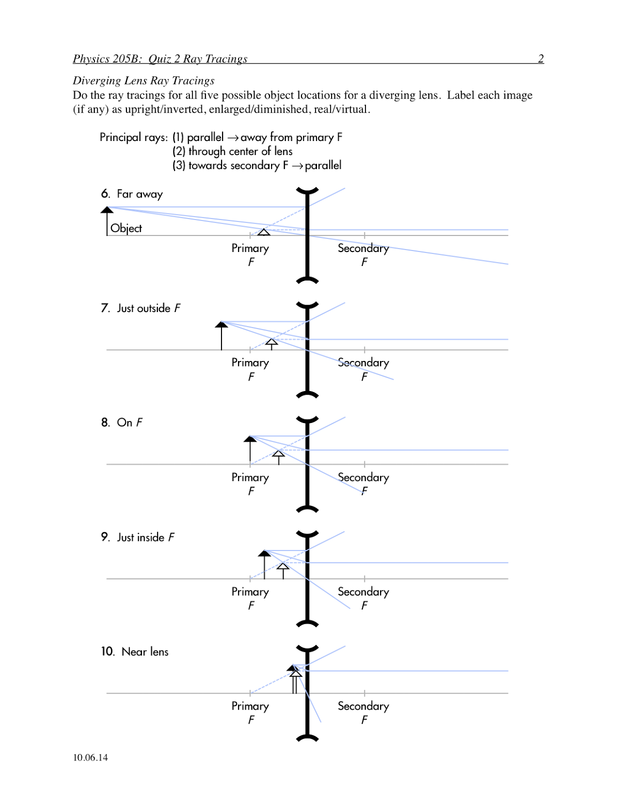 "A converging microscope objective lens uses a ray tracing where the object is just outside the objective lens' focal point to produce an enlarged, inverted, real image, which is placed at the eyepiece's focal point." "A microscope is a short tube that holds two separate lens apart from each other. In which light is passing through two different lenses, consecutively. The first lens picks up an object which in turn creates a real image, this image then becomes the object for the second lens for the eyepiece in which the person looking through the eyepiece can now see magnified." 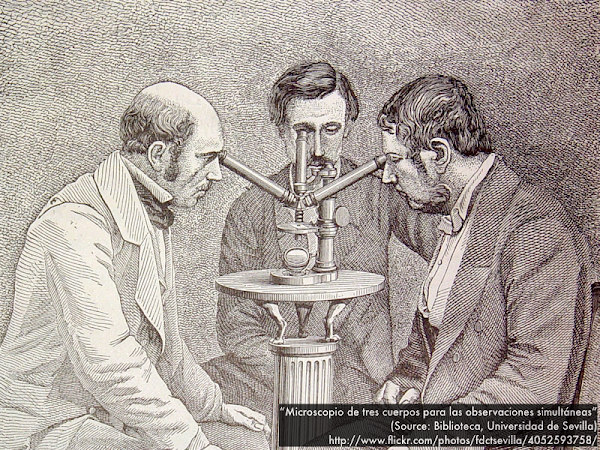 "Microscopes and telescopes pretty much have the same structure of eyepieces, objective lens, and a tube between each. When the objects rays go through the objective then it'll form a real image where it will be at the focal point of the eyepiece for maximum angular magnification. Sound waves can either be constructive (same troughs and peaks) or destructive (opposing troughs and peaks) depending on their phase and path length differences." "I hate that this asks what I understand--I don't feel as though I understand any of this." "I still am a little confused about modeling microscopes and telescopes with the ray tracing diagrams. How can you tell exactly how big the intermedia real image is going to be?" "Really hard time understanding the microscope ray tracings. I am not understanding how the reversal of principal rays works." "Ray tracings for both the microscope and the telescope confusing. I actually find the ray tracings in general to be confusing. Help." 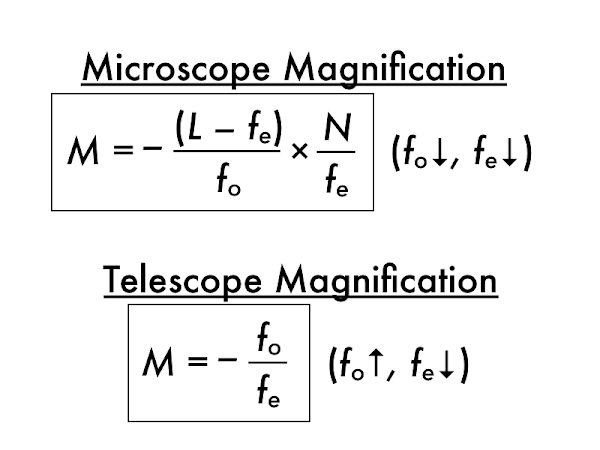 "The two equations detailing angular magnification for a microscope and telescope." "I don't completely understand why a microscope uses an objective lens with a short focal length and a telescope uses an objective lens with a long focal length. And is the first image produced by a telescope technically enlarged or diminished?" "I am still really struggling with are the ray tracings. I know I need to take more time to practice these and just get additional help. But I can assure you that I will be taking more time to figure this stuff out." 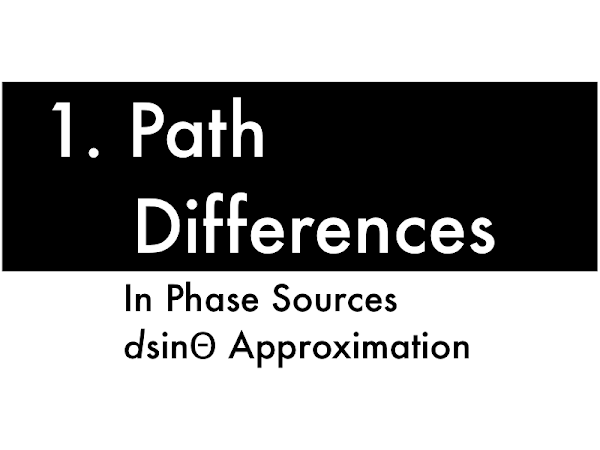 "I'm not sure what is the differences between phase difference and path length difference." "Can we lecture more on the wavelength stuff in class?" "I don't like ray tracings." Mars is __________ retrograde motion. (B) in the middle of. Retrograde motion occurs for Mars when the sun, Earth, and Mars are aligned (Mars in opposition). Drawing in lines from the sun to Earth and the sun to Mars indicates that Earth (which travels faster along its inner orbit), has already overtaken Mars (which travels slower along its outer orbit), thus Mars has already completed its retrograde motion. Retrograde motion occurs for Mars when the sun, Earth, and Mars are aligned (Mars in opposition). Drawing in lines from the sun to Earth and the sun to Mars indicates that Earth (which travels faster along its inner orbit), is about to overtake Mars (which travels slower along its outer orbit), thus Mars is about to start its retrograde motion. (D) pulls gas in around itself. Data from the European Space Agency's Rosetta spacecraft reveals that comet 67P/Churyumov–Gerasimenko has traces of __________ mixed in its topmost layers. Astronomy current events question: "Planet Nine" evidence? The following questions were asked on reading textbook chapters and previewing presentations on corrective optics and magnifiers. "A person who is near-sighted cannot see nearby objects at 25 cm and this is hyperopia, furthermore a person is given diverging lens to correct their vision. Oppositely, people who are far-sighted cannot see distances far away and this myopia, furthermore a converging lens is used to correct for this." "Corrective lenses are designed to create upright virtual images at an optimal distance in front of the eye so that it can best see them. 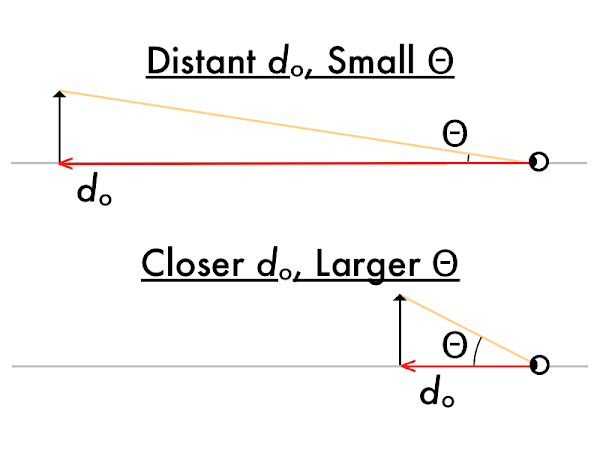 Diverging lenses correct for myopia by taking distant objects and creating a close-up virtual image, which becomes the object distance for the eye. 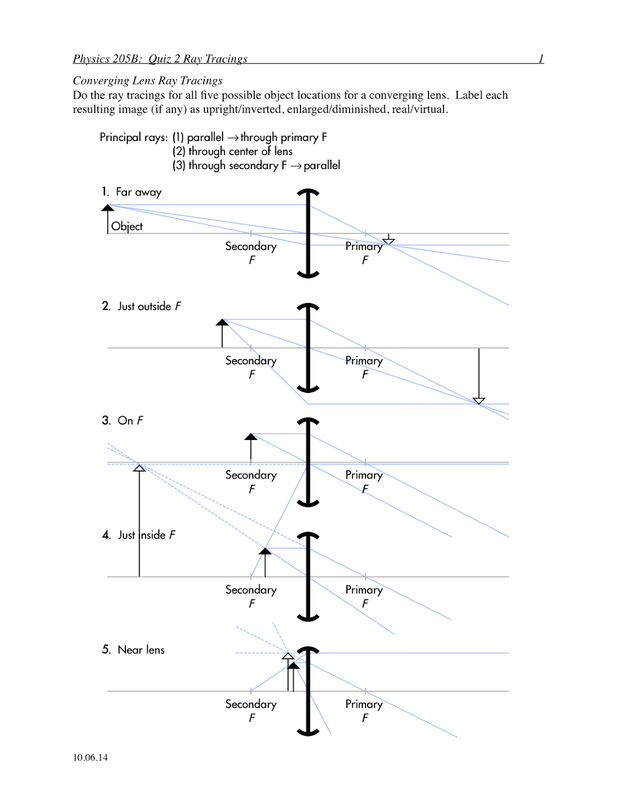 Converging lenses correct for hyperopia by taking close-up objects and creating a virtual image farther away, which once again becomes the object distance for the eye." "The angular size is not the actual size, it is a measure of how large an angle it subtends with your eye at the origin, and is a measure of how big something 'seems' from your viewpoint. When a converging lens with a focal length f is used a magnifier, the angular magnification is the ratio of the angular size as seen through the magnifier, compared to the angular size as seen with an unaided eye." "I would like to go over angular magnification if possible." 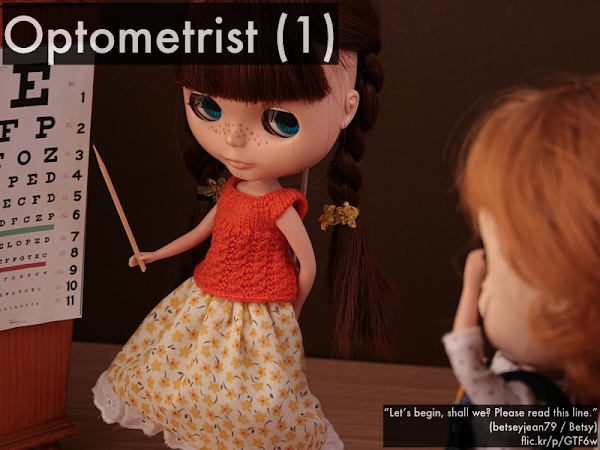 "Why the nominal farthest distance for a myopia prescription is positive infinity. I understand how it works in regards to the thin lens equation, but the concept itself is puzzling." "Could use some discussion on how m and M relate, if at all, and when to distinguish between the two." "I have to do some more reading. Everything with lens I am having trouble with. When is the math coming, I am better at that sort of stuff!" 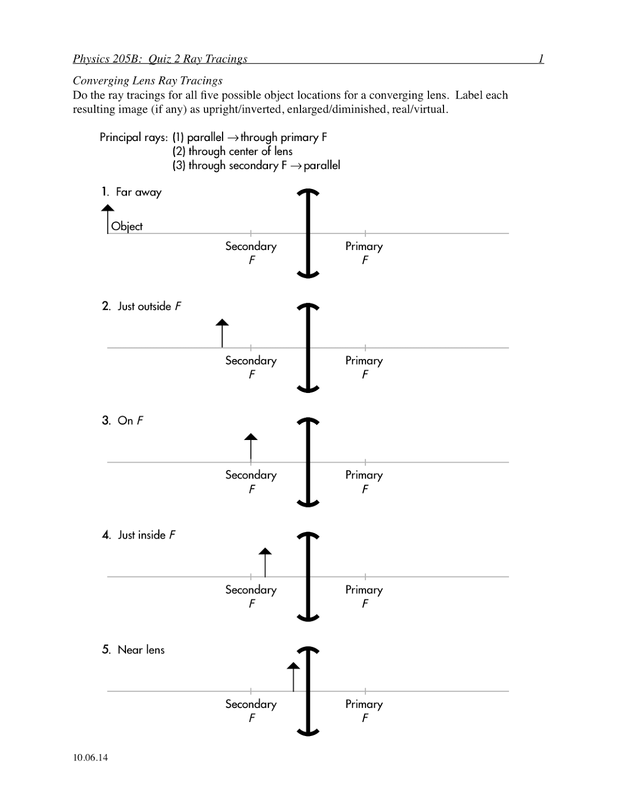 In general, a converging lens will produce virtual, upright images located __________ the original object. In general, a diverging lens will produce virtual, upright images located __________ the original object. State the units of optical power for lenses, and briefly describe the relationship between optical power P and focal length f.
"Diopters. P = 1/f, (+) values are converging lenses; (-) values are diverging lenses; and 0 is no power." "Units are the inverse of focal length, so 1/m." "Not sure how to answer this question." Explain the difference between the two types of magnification, m and M.
"m is for linear magnification and M is for angular magnification." "m is the magnification of the image, how large it is conpared to its size before. M is the angular magnification factor, and is a ratio of how much larger of an angular size the object now appears to be through the magnifier, compared to the naked eye." 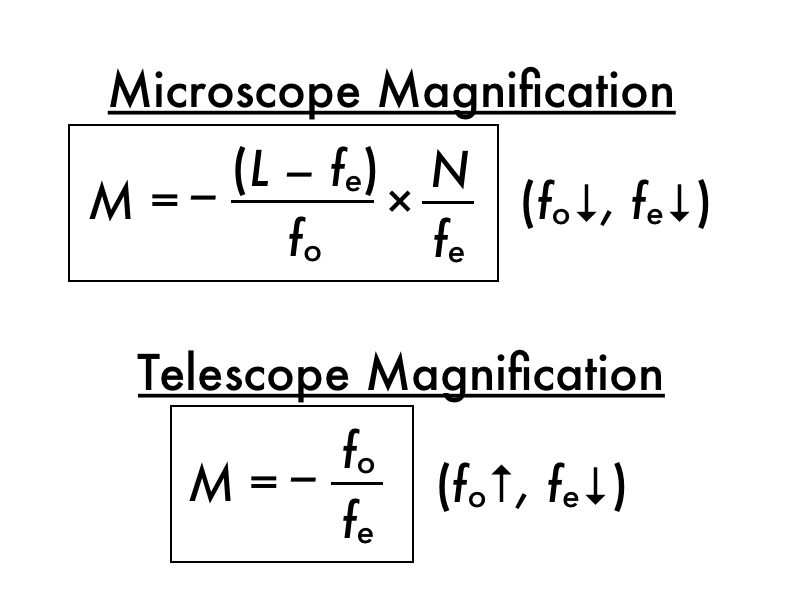 "I honestly thought they were the same, I just assumed the bigger M meant a greater magnification than m."
When a converging lens is used as a simple magnifier, the object is placed at a distance p = __________ in front of (to the left of) the lens. "Is there any way you could recap everything in class? I feel like I understand little bits of information here and there but am not able to put them all together coherently to be able to fully understand the subject." "I understand that we can calculate the prescription one needs by understanding his/her near point (NP) or far point (FP). We do this by using the two-step model, but how to plug in numbers and what they are is a mystery to me." "I have over a week to study this material and do this assignment, and I end up doing it at 11:00 PM the night before it's due. Even I don't understand me." "This stuff is hard, probably because I haven't thought about physics the last 12 days." "Infinity seems to be getting thrown around pretty casually in this section." "Ready for the next class." "I need to get with it. I'm not bad at stuff. I swear!"